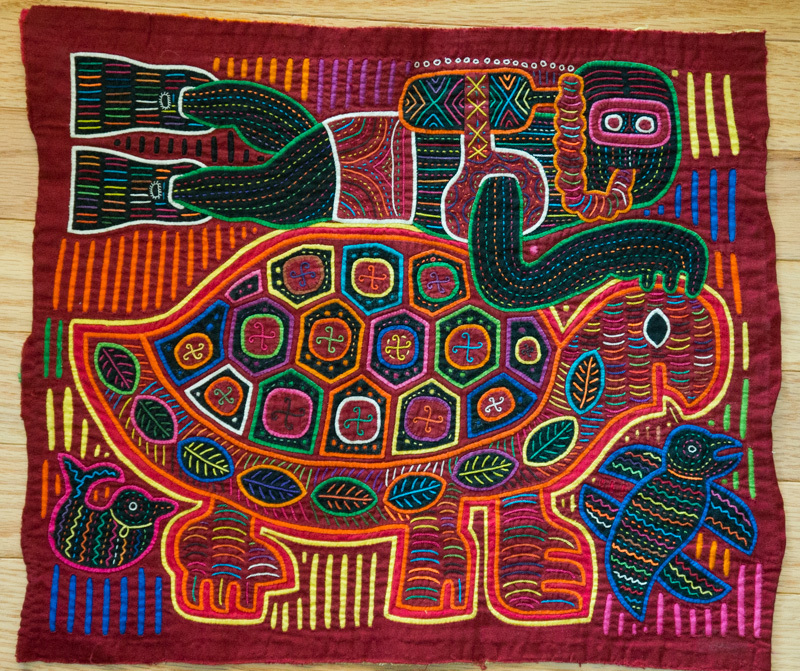 10.8.2013 Since I'm buzzing with textile fascination this week, I pulled out Jim's collection of 20 molas -- handiwork by the Kuna women (and albino men who can't work in the sun) of the San Blas Islands on the Atlantic side of Panamá. 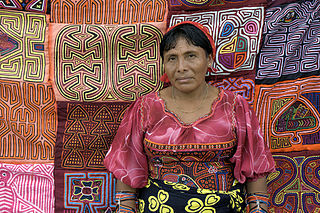 Molas are cotton rectangles that decorate the fronts and backs of women's blouses (see photo). They are done largely by hand in "reverse appliqué," layering 3 or 4 pieces of cloth and cutting out the design. It looks like some of the molas have machine embroidery added, although I shouldn't be surprised at what skilled little fingers can accomplish. The designs fill every square inch of the rectangle, the themes are fanciful, and the bright colors vibrate. 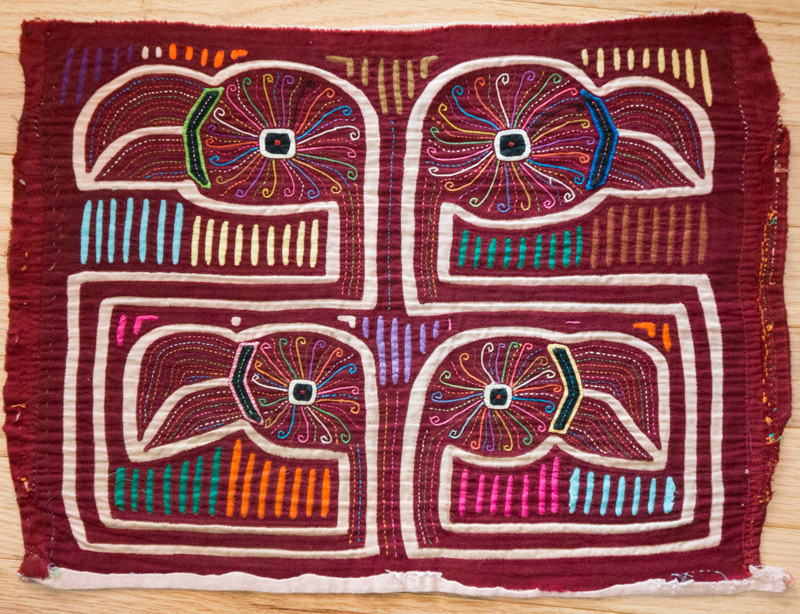 Jim discovered molas when he was in Panamá during his military service in the 1960s. Apparently the rest of the world did too, because it was about that time that interest in molas shifted from anthropologists to tourists. 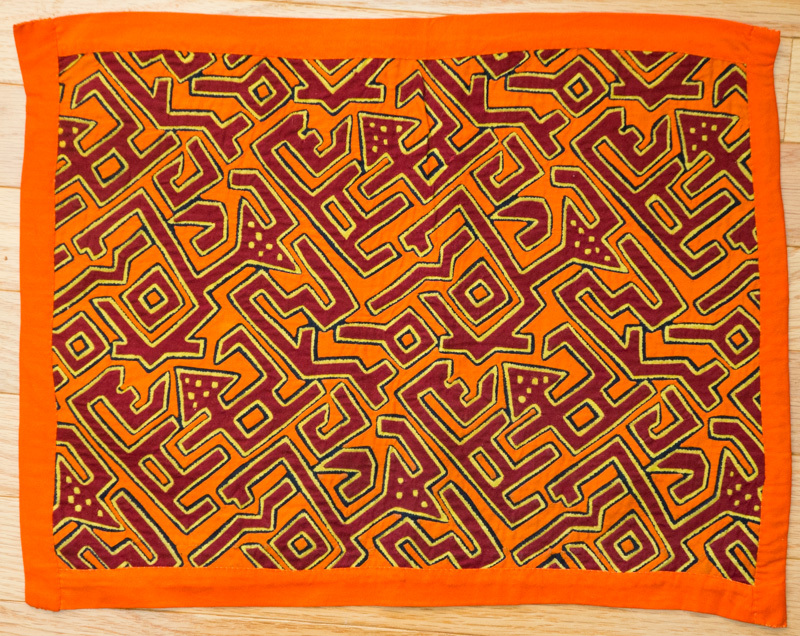 As a results, sale of molas became an important part of the Kuna economy. Browsing through the collection left me with two challenges. First, how could I display them? Putting them behind glass in a frame would kill them. We have a large one in the bedroom that is simply tacked to a wooden canvas stretcher -- okay, but that solution would create a storage problem. Then I thought I'd just attach them to the straight part of a wire coat hangar, which could be hung on a picture hook and would enable someone to lift up the edges to view the interesting construction. I went so far as to buy a bolt cutter at Home Depot to make light work of cutting hangars. But when I started, I discovered that the "straight" part of wire coat hangars is rarely straight. Apparently this is why people use wooden dowels for hanging textiles... but that would mean a trip back to Home Depot and my energy for the project was waning. Where would I hang them anyway? Solution: We have a big stack of used archival mat board. I cut a piece slightly larger than the scuba diver mola (above) then wrapped it in used fabric, gluing the turned edges to the back of the mat board. Then I simply used 4 straight pins to attach the top of the mola to my covered board. Voilá. No hangar but leaning them against something one at a time is probably a more practical solution anyway. Second, dare I try my hand at reverse-appliqué? My first response to myself was "You must be kidding." But wherever there are instruction books, I figure there must be folks who get successfully instructed. Jim has several books on traditional mola designs and the Kuna culture. I added to them by picking up a copy of "Mola Techniques for Today's Quilters" by Charlotte Patera. Like any kind of needlework, "all it takes" is patience and precision. So stay tuned. I might try a small patch for my current quilt project. This one looks older than the scuba mola above (which I bet was made for sale). I suspect the one below was actually part of a dress. Looking at the back leads me to conclude the teensy chainstitiching around the eyes was hand-embroidered, not machine-stitiched. The one below has an interesting abstract pattern. The yellow (bottom) layer is a channel revealed by cutting through the orange and black layers (double-channel appliqué). The red pieces were added (inlay appliqué), with the holes then reverse-appliquéd through the red to expose the yellow. Wow. PHOTO above: a fanciful composition of scuba dive and turtle.